The music artist Playfio has released information to the whereabouts of the sunset suspects who intend to meet in a secret location before fleeing the country. - a scrawled note found at the scene described a potential meeting location. The suspects have yet to be identified. 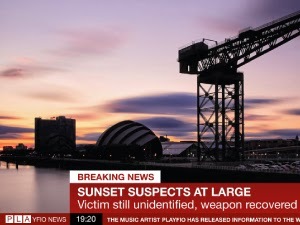 the police are urging people to come forward who may know anything The two suspects are still at large. The victim still unidentified was taken to the Southern General Hospital but later passed away. One of the suspects is from London but has not been named. Police have a recovered a possible weapon found near the scene.